The next step after the successful installation and activation of the plugin is to open a Software System that has been previously created using Sonargraph. Open the menu "Sonargraph" → "Open System..." and select the Sonargraph system. 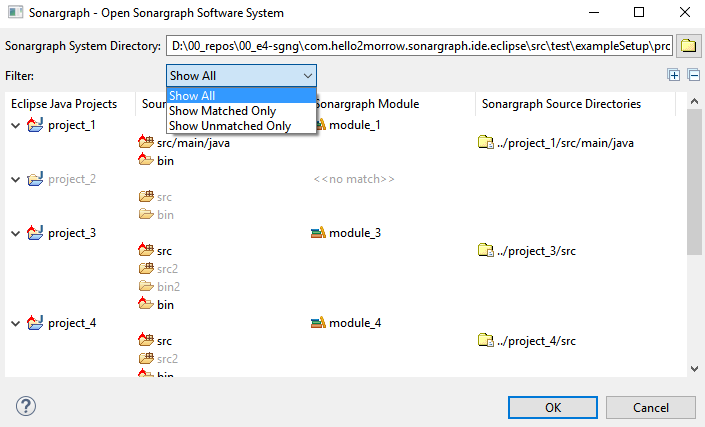 The red decorators and black font indicate, which Eclipse projects could be mapped to Sonargraph modules and which source and class directories are part of the Sonargraph workspace. The mapping is done based on matching source root directories. Projects and directories that are not part of the Sonargraph analysis are indicated by a gray font.